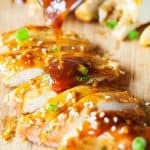 Slow Cooker Honey Garlic Chicken is a no-fuss, supremely delicious weeknight meal, pairing all of your favorites; chicken, honey, garlic and hoisin sauce, all within the sweet comforts of your slow cooker. 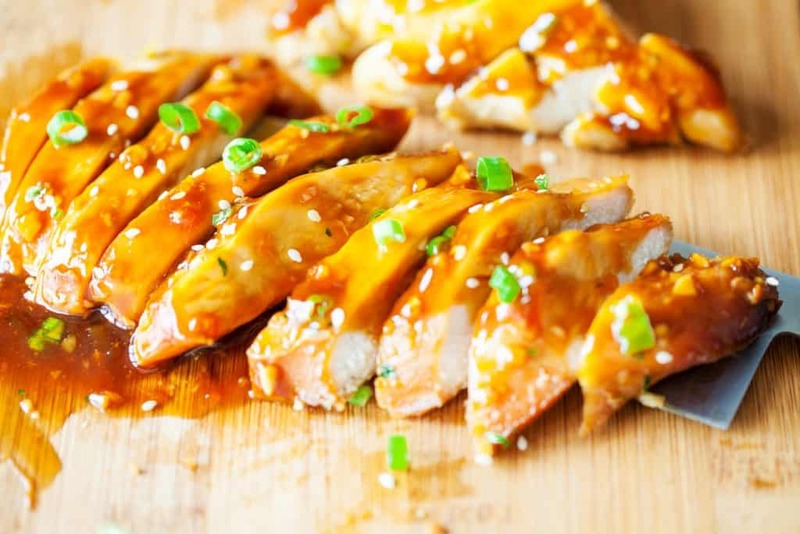 Skip the takeout and opt for this Asian-inspired Slow Cooker Honey Garlic Chicken instead. This entire recipe can be thrown together in 15 minutes! All you have to do is let it cook in the slow cooker while you go out and do what you do. You have two hours to run errands, go shopping, pick up the kids, or have a quick happy hour. When you get home, you’ll have a delicious better-than-takeout meal waiting for you. I recommend serving it with a side of steamed white rice and freshly steamed broccoli and send it over the top by drizzling the sweet and salty sauce over all the sides. Toasted sesame seeds take this dish to a whole new level! Sure, you can buy them already toasted, but the flavor is so much better when you do it at home. Just place the seeds in a heavy skillet over low heat. Stir them until they turn a dark golden brown. Remove them from heat and allow the seeds to cool. You can make this with Pork Chops as well, swap them out and let them cook a bit longer (depending on the thickness of course). I recommend between 2-3 hours. You can use chicken thighs in place of chicken breasts for this recipe as well. Why add the cooked chicken back into the Slow Cooker? Simple. I didn’t want to get any more dishes dirty. 🙂 Also, you want the sauce to coat every nook and cranny of the chicken so it is just easier to put the chicken back in, pour the sauce over, and then stir the chicken around to coat fully. It will also stay warm until you are ready to serve! Place the chicken in the bowl of a slow cooker. In a medium bowl, whisk together the soy sauce, honey, hoisin sauce, vinegar, oil, ginger, garlic, and scallions (white part only). Pour over the chicken. Cook on low for 2 hours, until the chicken reaches 165°F. Transfer the cooked chicken to a clean plate and tent loosely with foil. Let rest for 10 minutes. Transfer the liquid from the slow cooker to a small saucepan. Whisk 2 tablespoons of water with 1 tablespoon of cornstarch until smooth and creamy. Slowly add the cornstarch mixture to the sauce. Cook on high until thick, whisking constantly. Pour the sauce back in the slow cooker along with the chicken and toss to coat. Slice the chicken into strips and drizzle on the sauce. Garnish with the green scallions and sesame seeds. Serve warm with a side of steamed rice and vegetables. DID YOU MAKE Slow Cooker Honey Garlic Chicken? 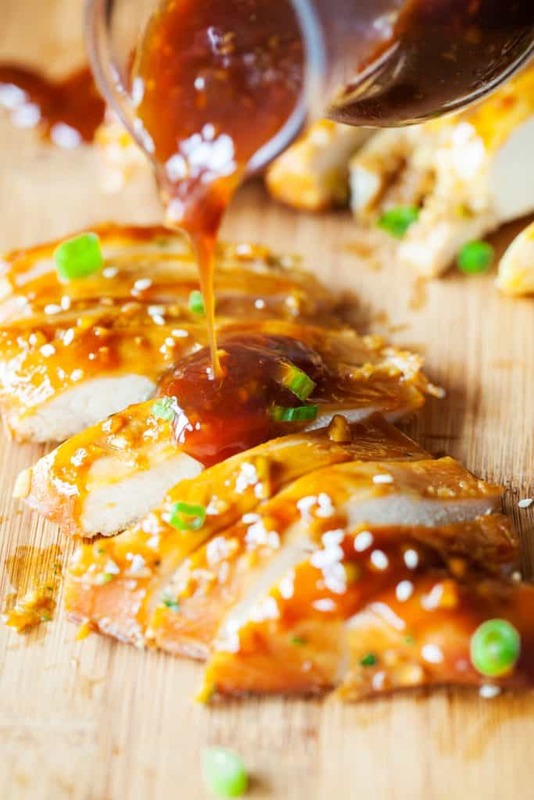 This slow cooker Honey Garlic chicken sons Awesome, cant wait to try it! This looks so good and I know our family will love it. However, we have one “no-honey” eater. Could either agave or sugar be used in place? Any other ideas for a honey substitution? 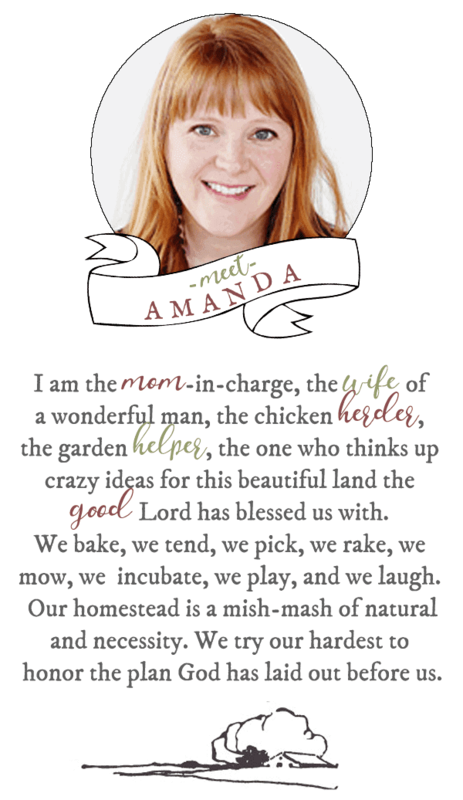 I really intend to try this recipe. I would love to email to my self but you do not offer that as an opeiton. You can always just write down the recipe. Made this tonight! Absolutely delicious! I honestly was sneaking a taste of some of the leftover sauce with a spoon before rinsing out the pot! Thank you and if there were stars to give, you’d get 5++++++! Looks good-plan to try soon! If you do not have hoisin sauce or rice wine vinegar – what might be a substitute for each? Wanting to try this today, but I forgot to thaw out my chicken, Would you recommend using frozen chicken and increasing the time?